LONDON Margaret Thatcher, the first female British prime minister referred to by both ardent supporters and critics as "The Iron Lady," died Monday. She was 87. Her former spokesman Tim Bell said she suffered from a stroke. Tough and proud of it, Thatcher was the steeliest British Prime Minister of modern times. Born Margaret Roberts in 1925, she became a chemist, a proud housewife, and a Conservative member of Parliament, which, she thought, was as far as she would get. "I don't think we will see a woman prime minister in my lifetime," Thatcher once said. In 1979, she proved herself spectacularly wrong, and her trademark -- helmet hair, cut-glass accent and bullying style -- became a staple of British satire. 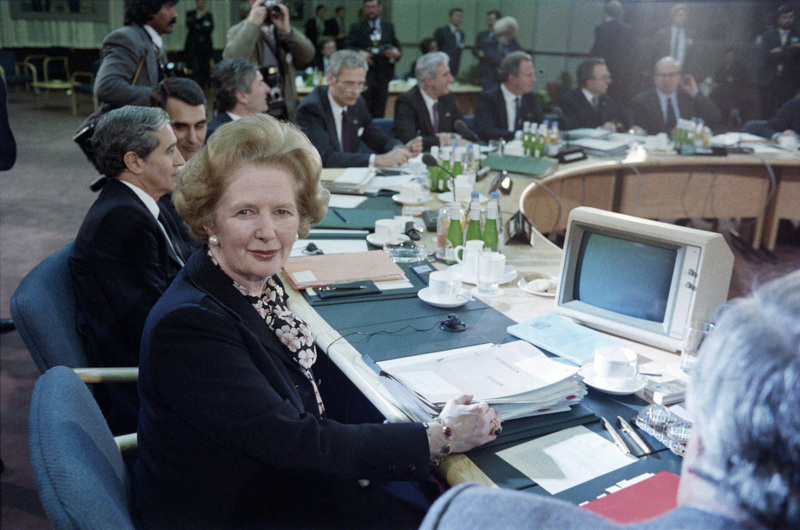 But the Iron Lady had a serious mission: to modernize British industry and break the powerful trade unions. The fallout was brutal -- violent strikes and rocketing unemployment -- but Mrs. Thatcher never wavered. Slowly, the economy did improve, and Mrs. Thatcher's uncompromising capitalism caught on with a new generation. In the 1980s, as an unlikely commander-in-chief, she led British forces to victory in the Falklands war against Argentina and appointed herself referee-in-chief between Moscow and the White House. Mrs. Thatcher was at the top of her game and loving it. "Yes, I hope to go on and on," she said at the time. Meryl Streep film has Margaret Thatcher's family "appalled"
But enemies were on the march. A deeply unpopular new property tax brought riots and her final undoing. In a bitter blow, her own party turned against her, and in 1990 threw her out. "We're leaving Downing Street for the last time," she said at the end. It was the first time she shed tears in public, and the beginning of a long decline. Margaret Thatcher grew frail and developed dementia. Britons will remember her as Maggie the Iron lady, who supporters still believe put the Great back into Britain.